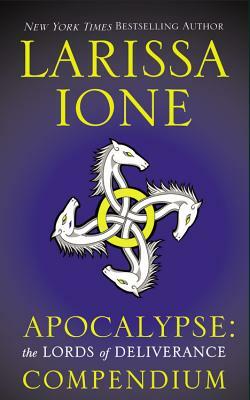 New York Times bestselling author Larissa Ione brings readers behind the scenes with this definitive guide to her latest imaginative, epic series featuring the Four Horsemen of the Apocalypse. With character descriptions, key player background information, a handy glossary of terms and special abilities, a Q&A inspired by reader questions, and an all-new, exclusive short story, this is a must-read for every Larissa Ione fan. As an added bonus, this compendium includes an extended sneak peek at the next book in the Lords of Deliverance series, Lethal Rider.